Unfortunately life sometimes gets in the way of this blog. The past month has been a whirlwind for me, and as a result, there are many reasons for my recent but short hiatus from blogging. Not only did I start a new job a little over a month ago, I've been writing papers, doing presentations, working on Bar Prep, taking exams, and traveling. I traveled home to celebrate my 25th birthday and my best friend's wedding, and then I had one last final to finish up last night after I got back. (More on that in my next post). I also had problems at the DMV (this always seems to happen to me), and some of my best friends decided to throw me a surprise party when I got back on Sunday night, which was very sweet of them. Consequently, I have been one busy lady! This recipe was kind of a crazy, throw-together-type-of-thing, but it turned out delicious. I knew that I wanted to make some sort of panini, but since I've used tomatoes in my, I don't know, last 5 posts or so, I felt the need to use something different. I picked up some fresh basil last night, and I've had a can of yams in my pantry for awhile now, so I figured I'd go for it. It's delicious yet whimsical, and it's pretty in its own way. 1 can yams, drained - 29oz. 1. First, add the basil, pine nuts, garlic, olive oil, and salt to a food processor. Process until smooth and creamy. Set aside. 2. Next, in a large skillet, and the onions, salt, olive oil, and 1/4 cup water. Bring the water to a boil, reduce heat to medium, and continue cooking until the onions are soft and tender, and the water has evaporated. 3. Stir in the yams, and mash down a little. Add a little more salt and of dash a cayenne. Cook on medium to medium-high heat for another 7 minutes. 4. Heat one side of your grill to high, and the other side to medium or medium-low. 5. Next, spoon 1/4 of the pesto mixture onto one-half of each flat bread, and then drizzle each half with 1 tsp. balsamic vinaigrette. 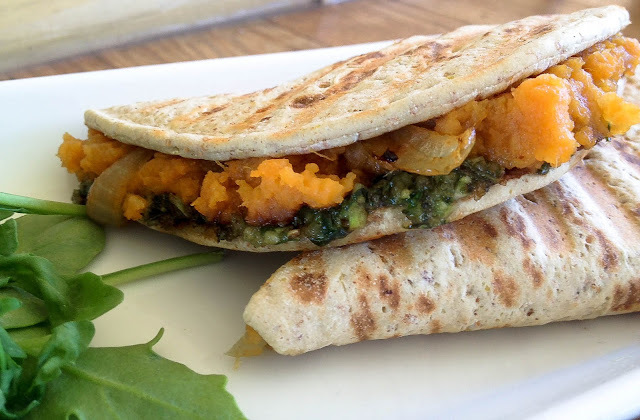 Cover each half with approximately 1/4 of the yam mixture, and then fold the top half of the flat breads over each sandwich. 6. Once the grill is heated, place each panini on the side heated with high heat. Cook for about 2 minutes on each side, pressing down on the paninis with a spatula a little, and then transfer the paninis to the side that's heated to medium, and cook for another 3 to 5 minutes. Notes: You can also use a panini press, Foreman Grill, or skillet to cook the paninis. Walnuts or pecans would also add a nice touch to the pesto. Really! Yams in a panini flatbread. Great idea and recipe. Thanks.